1. Edman, J.C.; Kovacs, J.A. ; Masur, H.; Santi, D.V. ; 14. Elwood, H.J. ; Sogin, M.L. Ribosomal RNA sequence shows Pneumocystis carinii to be a member of the fungi. Nature 1988, 334 (6182), 519-522. 2. Stringer, J.R.; Beard, C.B. ; Miller, R.F. ; Wakefield, A.E. A new name (Pneumocystis jiroveci) for Pneumocystis 15. from humans. Emerg. Infect. Dis. 2002, 8 (9), 891896. 3. Masur, H.; Michelis, M.A. ; Greene, J.B.; Onorato, I.; Stouwe, R.A.; Holzman, R.S. ; Wormser, G.; Brettman, L.; Lange, M.; Murray, H.W. ; Cunningham-Rundles, S. An outbreak of community-acquired Pneumocystis carinii pneumonia: Initial manifestation of cellular immune 16. dysfunction. N. Engl. J. Med. 1981, 305 (24), 14311438. 4. Kovacs, J.A. ; Gill, V.J. ; Meshnick, S.; Masur, H. New insights into transmission, diagnosis, and drug treatment of 17. Pneumocystis carinii pneumonia. JAMA 2001, 286 (19), 2450-2460. 5. Stringer, J.R.; Cushion, M.T. The genome of Pneumocystis carinii. FEMS Immunol. Med. Microbiol. 1998, 22 (1-2), 15-26. 18. 6. Lundgren, B.; Lipschik, G.Y. ; Kovacs, J.A. Purification and characterization of a major human Pneumocystis carinii surface antigen. J. Clin. Invest. 1991, 87 (1), 163 - 170. 7. Kutty, G.; Ma, L.; Kovacs, J.A. Characterization of the 19. expression site of the major surface glycoprotein of human-derived Pneumocystis carinii. Mol. Microbiol. 2001, 42 (1), 183-193. 8. Bishop, L.R. ; Kovacs, J.A. Quantitation of anti-Pneumo-cystis jiroveci antibodies in healthy persons and immuno-compromised patients. J. Infect. Dis. 2003, 187 (12), 20. 1844-1848. 9. Daly, K.R. ; Fichtenbaum, C.J. ; Tanaka, R.; Linke, M.J.; O'Bert, R.; Thullen, T.D. ; Hui, M.S. ; Smulian, A.G.; Walzer, P.D. Serologic responses to epitopes of the major surface glycoprotein of Pneumocystis jiroveci differ in human immunodeficiency virus-infected and uninfected 21. persons. J. Infect. Dis. 2002, 186 (5), 644-651. Lane, B.R. ; Ast, J.C.; Hossler, P.A. ; Mindell, D.P. ; Bartlett, M.S. ; Smith, J.W. ; Meshnick, S.R. Dihydropter-oate synthase polymorphisms in Pneumocystis carinii. J. Infect. Dis. 1997, 175 (2), 482-485. Sloand, E.; Laughon, B.; Armstrong, M.; Bartlett, M.S. ; Blumenfeld, W.; Cushion, M.; Kalica, A.; Kovacs, J.A. ; Martin, W.; Pitt, E.; Pesanti, E.L.; Richards, F.; Rose, R.; Walzer, P. The challenge of Pneumocystis carinii culture. J. Eukaryot. Microbiol. 1993, 40 (2), 188-195. Gigliotti, F.; Harmsen, A.G.; Haidaris, C.G. ; Haidaris, P.J. Pneumocystis carinii is not universally transmissible between mammalian species. Infect. Immun. 1993, 61 (7), 2886-2890. Peglow, S.L. ; Smulian, A.G.; Linke, M.J.; Pogue, C.L. ; Nurre, S.; Crisler, J.; Phair, J.; Gold, J.W. ; Armstrong, D.; Walzer, P.D. Serologic responses to Pneumocystis carinii antigens in health and disease. J. Infect. Dis. 1990,161 (2), 296-306. Hauser, P.M.; Francioli, P.; Bille, J.; Telenti, A.; Blanc, D.S. Typing of Pneumocystis carinii f. sp. hominis by single-strand conformation polymorphism of four ge-nomic regions. J. Clin. Microbiol. 1997, 35 (12), 30863091. Lee, C.H. ; Helweg-Larsen, J.; Tang, X.; Jin, S.; Li, B.; Bartlett, M.S. ; Lu, J.J.; Lundgren, B.; Lundgren, J.D. ; Olsson, M.; Lucas, S.B. ; Roux, P.; Cargnel, A.; Atzori, C.; Matos, O.; Smith, J.W. Update on Pneumocystis carinii f. sp. hominis typing based on nucleotide sequence variations in internal transcribed spacer regions of rRNA genes. J. Clin. Microbiol. 1998, 36 (3), 734-741. Tsolaki, A.G.; Beckers, P.; Wakefield, A.E. Pre-AIDS era isolates of Pneumocystis carinii f. sp. hominis: High genotype similarity with contemporary isolates. J. Clin. Microbiol. 1998, 36 (1), 90-93. Lee, C.H. ; Lu, J.J.; Bartlett, M.S. ; Durkin, M.M. ; Liu, T.H. ; Wang, J.; Jiang, B.; Smith, J.W. Nucleotide sequence variation in Pneumocystis carinii strains that infect humans. J. Clin. Microbiol. 1993, 31 (3), 754757. Latouche, S.; Ortona, E.; Mazars, E.; Margutti, P.; Tamburrini, E.; Siracusano, A.; Guyot, K.; Nigou, M.; Roux, P. Biodiversity of Pneumocystis carinii hominis: Typing with different DNA regions. J. Clin. Microbiol. 1997, 35 (2), 383-387. Walker, D.J. ; Wakefield, A.E. ; Dohn, M.N. ; Miller, R.F. ; Baughman, R.P. ; Hossler, P.A. ; Bartlett, M.S. ; Smith, J.W. ; Kazanjian, P.; Meshnick, S.R. Sequence polymorphisms in the Pneumocystis carinii cytochrome b gene and their association with atovaquone prophylaxis failure. J. Infect. Dis. 1998, 178 (6), 1767-1775. Ma, L.; Kutty, G.; Jia, Q.; Imamichi, H.; Huang, L.; Atzori, C.; Beckers, P.; Groner, G.; Beard, C.B. ; Kovacs, J.A. Analysis of variation in tandem repeats in the intron of the major surface glycoprotein expression site of the human form of Pneumocystis carinii. J. Infect. Dis. 2002, 186 (11), 1647-1654. Pneumocystis carinii pneumonia by restriction fragment length polymorphism. Scand. J. Infect. Dis. 2000, 32 (5), 481-483. 25. 22. Wakefield, A.E. ; Pixley, F.J.; Banerji, S.; Sinclair, K.; Miller, R.F. ; Moxon, E.R. ; Hopkin, J.M. 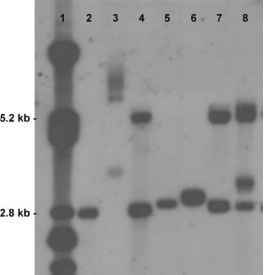 Detection of Pneumocystis carinii with DNA amplification. Lancet 1990, 336 (8713), 451-453. U.G. ; Lundgren, J.D. ; Lundgren, B. Diagnostic use of PCR 26. for detection of Pneumocystis carinii in oral wash samples. J. Clin. Microbiol. 1998, 36 (7), 2068-2072. Pneumocystis carinii. J. Clin. Microbiol. 1995, 33 (10), 2785-2788. Larsen, H.H. ; Masur, H.; Kovacs, J.A. ; Gill, V.J. ; Silcott, V.A. ; Kogulan, P.; Maenza, J.; Smith, M.; Lucey, D.R. ; Fischer, S.H. Development and evaluation of a quantitative, touch-down, real-time PCR assay for diagnosing Pneumocystis carinii pneumonia. J. Clin. Microbiol. 2002, 40 (2), 490-494. Maher, N.H.; Vermund, S.H. ; Welsh, D.A. ; Dillon, H.K. ; Awooda, A.; Unnasch, T.R. Development and characterization of a molecular viability assay for Pneumocystis carinii f. sp. hominis. J. Infect. Dis. 2001, 183 (12), 18251827.